Like many people, I am a candle addict and if I can sit at home burning a candle that will instantly take me back to Disney with a smell then I'm all for it, one of the things I always notice on Disney trips are the smells, Main street, the food, the resorts they all have their unique smells and they stay with you just like the special moments and other fun times from the trip. 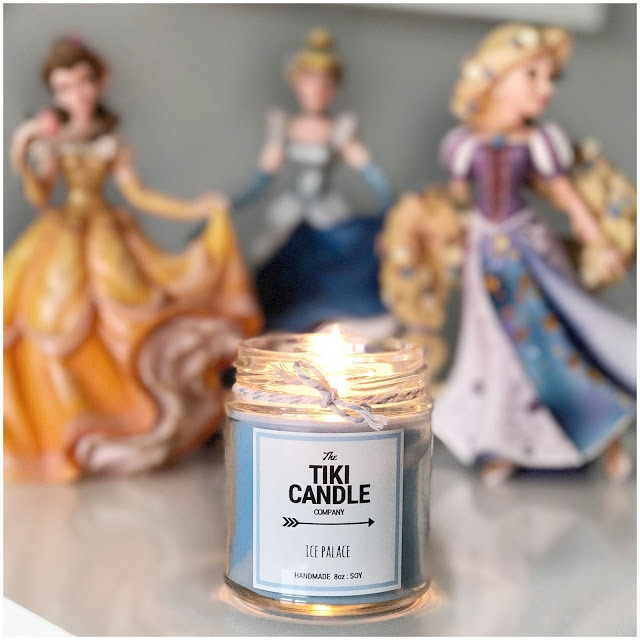 There seem to be quite a few companies now selling Disney inspired candles and when decided who to place my first order with it was between Tiki Candle company and another, however the other company had temporarily closed their shop which ended up working out great because the candles from Tiki were brilliant, the scents were strong and really nice and I love the design of the jars. I've had about 4 or 5 from them now and not been disappointed by any, the Ice palace one which I'm sure you can figure out is based on Frozen is beautiful and definitely a favourite of mine. I've also bought the wax melts as presents and they too got good feedback which considering how much of a bargain they are I was really pleased to hear. So if you're looking for Disney scented candles I highly recommend you checking these guys out and I'm pretty certain you won't be disappointed either. You had me hooked just from the photography! These candles looks perfect. I tend to buy candles but hardly burn them but these look so fairly priced that I can't resist.